I’ve recently arrived back in the UK after working in Paarl which is located just outside Cape Town. This iconic City which has Table Mountain as its famous backdrop was going to be my home for the next three months. Coming from the English countryside I’m not use to the hustle and bustle of living in a city but it didn’t take long to get use to the city life. The city is a very relaxed and laid backed and life always seems to go slower in Cape Town. Its easy to fall in love with the summer vibes of the mother city. Especially when you have beaches like Camps Bay and Clifton beach. Whilst sitting on the beach at Camps Bay with Lions Head and Table Mountain shadowing the beach, you can easily see why so many people are attracted to this city. With Cape Town being the gateway to the cape wine lands, most weekends were spent chilling in the many vineyards that populate the surrounding city. With the rolling hills as far as the eye can see, filled with vineyards and the constant supply of wine, its hards not to fall in love. If wine tasting isn’t your thing then there’s plenty of other activities to get up to. Surfing at Bloubergstrand is always a fun past time, with Table Mountain in the distance and Robbin island in full view there isn’t much better places to go surfing. Bloubergstrand also offers plenty of bars over looking the beach. Blue Peter being my favourite as its the only place in which i can find a decent pint of Guinness in Cape Town. If you feeling adventures then theres plenty to keep you occupied. Lions Head is always a good walk, just don’t do it on the hottest day of the year like I did. 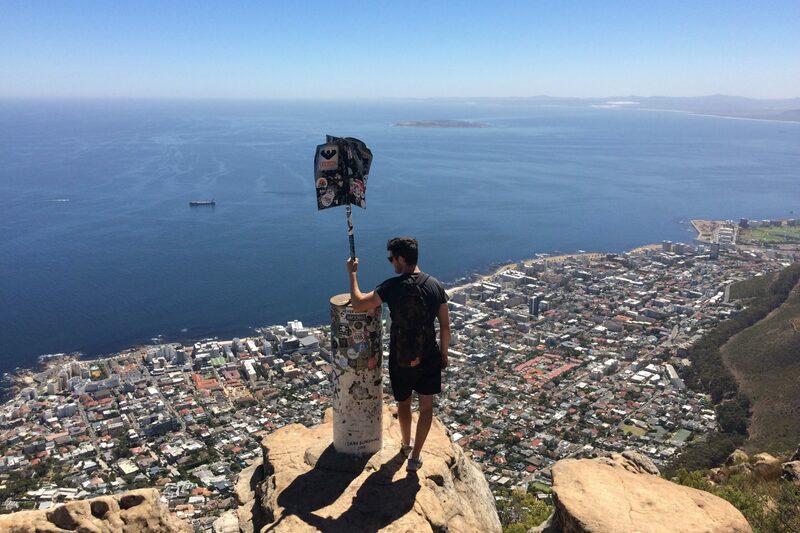 Bottom of Africa but on top of the world. Table Mountain might be the bigger out of the two but I found Lions Head to be more challenging and I probably found it more enjoyable than climbing Table Mountain. The Views from the top are spectacular and the route to the top is more interesting than Table Mountain. You can also do a full moon hike up Lions Head which I can imagine being amazing once you make it to the top. Visiting Table Mountain is surely on most people bucket list and is defiantly one to experience and the most rewarding way to experience Table Mountain is to climbing to the very top. You can always take the cable cart up to the top with all the other tourist but you don’t claim the novelty of climbing Table Mountain. When I climbed table mountain it took and hour and a half slugging away to get to the top but the view was amazing and the gin & tonic from the restaurant at the top made it so worth while. From the top of Table Mountain you can get a good view of the V&A waterfront. The waterfront has plenty to do, you can ride the ferris wheel or catch a boat out to Robbin Island. The waterfront has lots of shops on offer and plenty of restaurants and bars with table mountain towering over the waterfront. Overall the Cape Town is the most amazing and prettiest place I’ve ever been to. You’ll never be disappointed of this vibrant African city and theres never a dull day in Cape Town.